Bryce Canyon National park lies within the Colorado Plateau geographic province of North America and straddles the southeastern edge of the Paunsagunt Plateau west of the Paunsagunt Fault. Park visitors arrive from the plateau part of the park and look over the plateau’s edge toward a valley containing the fault and the Paria River just beyond it. The edge of the Kaiparowits Plateau bounds the opposite side of the valley. 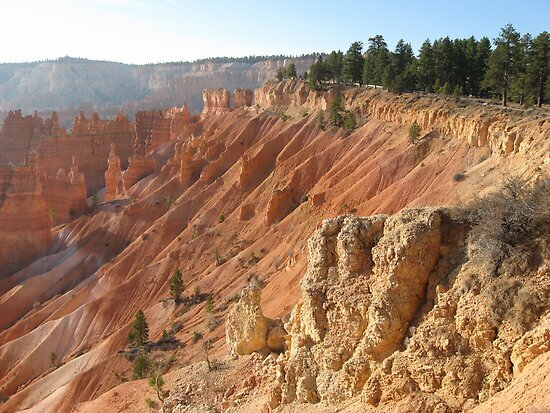 Bryce Canyon was not formed from erosion initiated from a central stream, meaning it technically is not a canyon. Instead headward erosion has excavated large amphitheater-shaped features in the Cenozoic-aged rocks of the Paunsagunt Plateau.